First Principles are basic, self-evident assumptions – something that cannot be deduced from any other assumption. In other words, they are the core beliefs upon which all of other assumptions and ideas are based. What that does have to do with warehousing and order fulfillment services? Well, every company must decide what tasks they want to do, and what tasks they want other people to do for them. Henry Ford wanted to do everything, all the way to owning the mines which product the iron ore for his automobiles. We all realize that is mostly impossible today. Looking at First Principles will be a great help in the decision making process. The decision to outsource order fulfillment is an extremely emotional decision. If you are a small business owner, you are passionate about your products. You may have designed them, crafted them, or invested a personal fortune in buying them. You deal with them daily, and they are the lifeblood of your company. Why on earth would you let someone else store, handle, package and ship them? How can you trust someone else with the very things that you hold so dear? At times like these you need to look at your First Principles. The most basic is that you only have 24 hours each day, and not all of that can be spent on business. It is then obvious that you cannot pick, pack and ship every order. So it becomes a question of how best can you use the time available to you? Do you have the physical space and people you trust to handle your order fulfillment? Is lack of space making you inefficient? Are you constantly drawn into fulfillment or personnel problems, keeping you away from crucial product design, marketing, or sales activities? If your analysis leads you to outsourcing, you still have to deal with the emotions of letting go. Can you turn to someone who can be almost as passionate about your products as you are? As the former owner of a manufacturing company, I understand how important your products are to you, and how important that first impression is as customers receive their shipments. I can share your passion, and make sure that all of our personnel are just as passionate. All order fulfillment companies are not the same – make sure you can make a connection with the people that set the tone for the company, and that they share the same values and concerns as you do. We go by many names – 3PL, Pick & Pack, Order Fulfillment Centers, etc. And there are many of us. With the proliferation of on-line shopping, the number of companies similar to Alternative Logistics is growing rapidly. So how do you know which one to work with? There are the obvious differentiators — location, hours of operation, available warehouse space, services provided, etc. And there is cost – we all have different rates depending upon our size, location, and levels of service. But even then, you may find several of us to choose from. In a previous career, I was the operations manager for a small company that designed industrial products. We worked with a contract manufacturer for all of our inventory management and order fulfillment. What made the relationship work is that the other company put themselves in my shoes – they did everything they could to become more efficient and keep my costs down. Now that I am on the other side of the fence, I have brought the same philosophy to Alternative Logistics. My goal is to always look at things as our clients would. A consultant recently made the comment, “It is in your (Alternative Logistics’) best interest to be inefficient so you can charge your clients more.” That is absolutely not the case! That philosophy might work in the short run, but never in the long run. I know all of our clients are in competitive markets, and they need to continually lower their costs. As their partner, it is my duty to constantly seek ways to become more efficient so we can lower their warehousing and order fulfillment costs. Over the past year, Alternative Logistics has invested close to $100,000 in facility and equipment upgrades in the name of efficiency. We have bought flow racks, cantilevered racking, shelving and carts. We are in the midst of a software upgrade to streamline our administrative tasks. And in a subsequent post I will describe the automation equipment we have obtained that has reduced the time to perform certain tasks by over 75%. Since most of our clients pay us on an hourly basis, they are getting much more work done per dollar spent. So, when you are evaluating order fulfillment companies, can you assess their core philosophies? Do they view clients as cash cows, or someone that they can partner with? Are they constantly assessing processes and procedure, and will they invest in new equipment, to become more efficient? How often do they have price increases? Does their corporate culture mesh with yours? A few months ago, one of my daughter’s friends was upset. Her mother had founded and organization, called NuDay Syria, that collected food, clothing and medical supplies for refugees in Syria. I won’t go into detail about the massive humanitarian need in Syria, with over nine million people who have lost their homes. 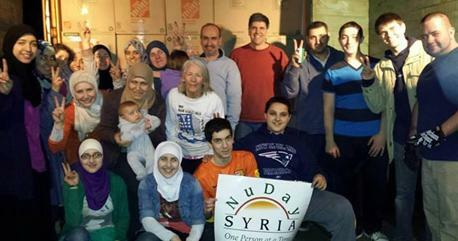 See www.nudaysyria.net for details. Anyway, my daughter’s friend was upset because the warehouse space that NuDay Syria had been using was no longer available to them. My daughter quickly volunteered space in the warehouse here at Alternative Logistics. Since January, I am pleased that Alternative Logistics has been able to store the donated materials. Once each month or so, a small army of volunteers comes in over a weekend, sorts and packs all of the material, and loads it onto a container bound for refugee camps in Turkey or Syria. It is inspiring to see the amount of donated material, and heart warming to see the many people donate their weekend to loading the container. I am pleased that Alternative Logistics can do its small part to help the process. The look of the site is new, but our experience in order fulfillment and our dedication to customer service are not. We just passed our twenty-year anniversary of providing outsourced logistic services to our clients. Several of our clients have been with us for well over half of that time. Our mission is to help our clients grow. We love to see start-ups take-off, even if they outgrow their need for us, secure in the knowledge that we played a key role in their growth. If you are in the start-up phase, we can work with you on a personalized level to ensure you get the services you need at a price you can afford. We like to do those tasks that you don’t enjoy. As an entrepreneur, you must be dedicated to your products and your customers. You must be close to your customers to know what they need, then design and package products to meet those needs, and finally follow up with them to make sure they get what they expect. Of course, we also work with established companies as well. Some clients need an east coast presence, others like our labor rates for kitting projects, and some are just tired of trying to do everything themselves. Whatever your needs, give us a call or complete the contact form on our web site, and see how we can help you today.